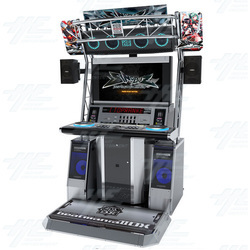 Beatmania IIDX 24: Sinobuz is the most recent arcade release in the Konami’s popular Beatmania music and series. It was released in october 2016 and has a ninja theme. Beatmania IIDX is a series of music rhythm games that was first introduced by Konami in Japan in 1999. IIDX has since spawned 24 arcade releases. Beatmania IIDX 24 has new visual and BGM themes that are based on Ninjas. A “ninja rank” evaluates the skills of the players. A new feature was added to Beatmania IIDX 24: the teacher-student system. It works between 2 players who receive rewards when their relationship grows. In IIDX games, players recreate the musical score of songs available to them through the use of a DJ simulating controller. The player must coordinate their hands in order to hit the correct keyboard buttons, spin the turntable, or a combination of both in correspondence to color-coded notes that approach the judgement bar displayed on screen. Notes are divided on screen by columns which separate them accordingly to match the seven buttons and the turntable on the DJ simulating controller. As a result of hitting notes, different sounds are then produced throughout a song’s duration. Correctly hitting notes will produce an accurate musical score, while incorrectly hitting notes will produce inaccuracies and mistakes in the music. Music is an integral part of the beatmania IIDX series. Featuring a wide selection of genres and artists, both licensed and in-house, the Beatmania IIDX series is well known for its original music. Beatmania IIDX is a series of music rhythm games that was first introduced by Konami in Japan in 1999. IIDX has since spawned 24 arcade releases. Beatmania IIDX 24 has new visual and BGM themes that are based on Ninjas. A “ninja rank” evaluates the skills of the players. A new feature was added to Beatmania IIDX 24: the teacher-student system. It works between 2 players who receive rewards when their relationship grows. Notes are divided on screen by columns which separate them accordingly to match the seven buttons and the turntable on the DJ simulating controller. As a result of hitting notes, different sounds are then produced throughout a song’s duration. Music is an integral part of the beatmania IIDX series. Featuring a wide selection of genres and artists, both licensed and in-house, the Beatmania IIDX series is well known for its original music.